Missouri Lt. Gov. Peter Kinder, pictured here in 2010. 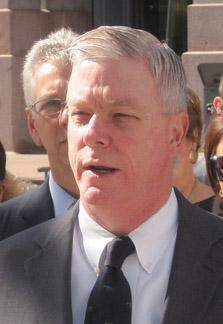 The Missouri State Auditor's office is reviewing a reimbursement payment Lieutenant Governor Peter Kinder made earlier this week. Kinder wrote a personal check for $52,320 - up from the $35,050 he initially said he would reimburse the state. Kinder has said all of the travel and associated costs were for legitimate state business. Deputy State Auditor Harry Otto says the audit will not cover what Kinder actually did on those trips, rather just how he came up with the number. "We don't intend to drill into a calendar and make a determination with respect to a trip was 82.5 percent state and 17.5 percent non-state business," Otto said. Republican State Auditor Tom Schweich has recused himself from the audit since Peter Kinder was a major donor to his campaign. When asked to share his official state calendar with reporters, Kinder's office initially said the calendar was destroyed. Updated 5:48 p.m. April 28 with comment from Otto, replaces original Associated Press story. Missouri Lt. Gov. Peter Kinder has paid the state $52,320 to cover any potentially questionable expense reimbursements during his term in office. Kinder wrote the check from his personal funds - a change of plans from when he announced earlier this month that his campaign would pay the state $35,050 to cover St. Louis area hotel stays cited in a story by the St. Louis Post-Dispatch.